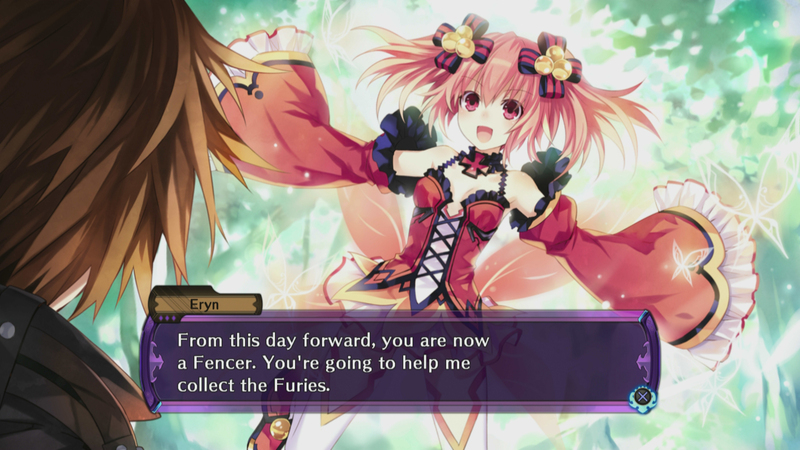 Fairy Fencer F is the first of Compile Heart’s RPGs that has been released under the Galapagos Brand. This brand brings together many industry veterans such as Nobuo Uematsu, Tsunako and Toshiki Inoue. Some of the Hyperdimension Neptunia team is along for development, as well. 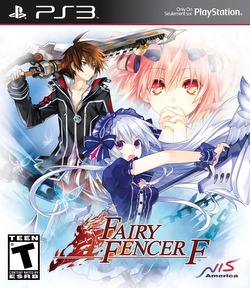 Needless to say, being a fan of Japanese style RPGs and the Neptunia series, I was very excited when this was announced for localization from NIS America. Let’s see if all of my hype panned out. Long ago, a batte between the Goddess and the Vile God shook the very foundations of this world. Though the two were equally matched, the battle came to end when they created a number of very special weapons. These weapons contained the life force of fairies themselves and would later be known as Furies. With these weapons, they were able to seal away the powers of their foe before falling into a deep sleep. Our story follows a young man named Fang who found himself in need of some food, since he was always hungry. Not having cash to get some grub, he decided to try and pull a mystical Fury out of the ground, since it was told they would grant any wish. To his surprise, this was not the case, and he was accepted by the fairy inside and would now be known as a Fencer. From here, he would find himself directly involved in that age-old conflict between the Goddess and the Vile God, and discover much more about himself than he could ever imagine. This one had a lot of the characters interacting together in cutscenes, and that is something I really love in an RPG. I feel this not only adds to the story greatly, but it gives you a sense of understanding, and most of the time caring for these characters by the end of your journey. From Harley “examining” Eryn to the constant jabs at each other from Fang and Tiara, I found a lot to love here. I really loved the art style and graphics, as well. It was made with the Hyperdimension Neptunia V engine, but it looks they have really tweaked that engine, making this one look much better than previous titles. All of the characters models in the game are detailed and look really good. While the dungeon maps themselves look decent, you can tell there was as much care put into them as the characters themselves. They don’t look bad, but they are nothing to write home about either. One other thing I really liked was when you obtained a new fairy they would show up in your menu on a card. Each of these had some really nice artwork on them, so I was thrilled to get a new fairy not only to make my party better, but to check out the artwork, as well. In the sound department, the music here does not disappoint — featuring some well-known artists, such as Kenji Kaneko, Toshiki Kato, and even famed Final Fantasy composer Nobuo Uemastu lends his skills to this amazing soundtrack. There is a mix of slower tunes, as well as some hard-rocking battle themes. It has been quite a while since an OST has really gripped my attention, but this one managed to do just that. The English dub is nice, for most part, though I have to say the choice to make Galdo Canadian really threw me off. I don’t think there is anything really wrong with it, but it was a “Whoa, what the hell is that?” moment, for sure. The first time heard him say “EH,” all I could think of was that old SCTV skit with the Mckenzie brothers. Yeah, I know I’m old, but that is what I thought of. This one is dual audio, as well, so, if you want to go with the Japanese audio, it is here for your listening pleasure. Now, let’s start digging into the gameplay of this bad boy. 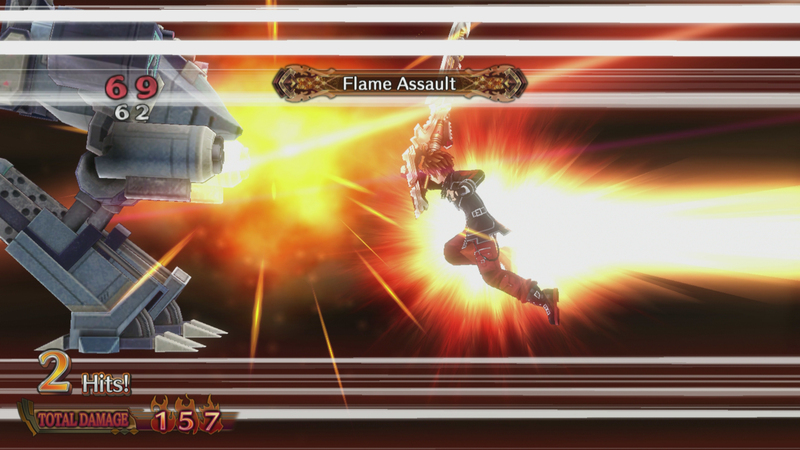 If you have seen any footage of this, you know the combat plays out a lot like Neptunia V’s. 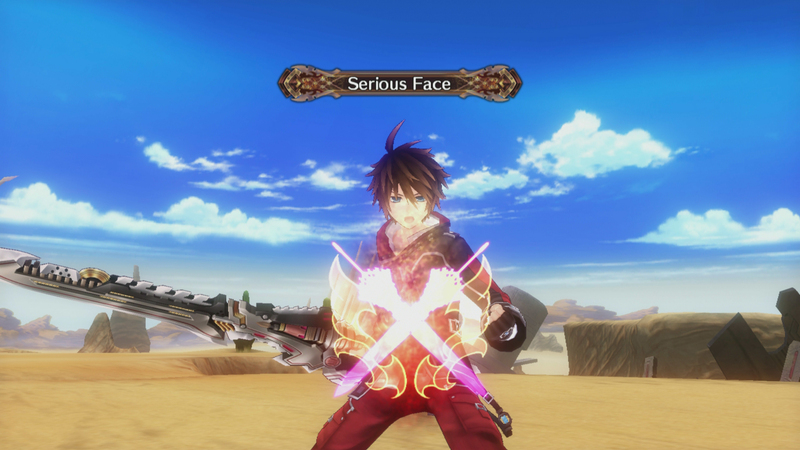 Enemies appear on screen, and you can attack them first by pressing the X button for symbol, just like in other Compile Heart games. Battles here are still turn-based, and you still move into position and attack. What is different here is the Tension Gauge and Fairize skill. The Tension Gauge will increase as you deal or receive damage, but it will fall if you miss an attack or heal yourself. As your tension increases, your physical attack damage will increase, but, if you have low tension, you will lose some damage off your attacks. When the gauge reaches a certain point you can Fairize, which means you will join with your Fury and turn into Fury Form. Think of this like going HDD Mode on a Neptunia game — all of your stats increase and you will be able to use special skills. You will remain in this form as long as your Tension Gauge remains high. This will be very helpful in boss battles, and can get you out of a bind if you’re getting beat down by some nasty baddies. As usual, you will gain EXP, cash and a few drop items after battle. You will also gain some WP points, which will allow you to upgrade your equipped Fury. You can raise such stats as physical attack and defense, teach new skills and even add more attacks to your turn by boosting your combo. Combo attacks on here work a little bit like combos in the Neptunia games, but there is a bit more to it. You can pop enemies up in the air and do follow-up attacks for extra damage, or equip an all-out attack with low accuracy unless you opponent is stunned. There are many possible combinations to choose from. You can teach your characters additional moves and weapon forms from the boost menu with WP points. As I mentioned before, Furies contain fairies, so, as you collect them, you will gain new allies in your fight. Though they do not take to the battle directly, they can be equipped on your party members, giving them additional skills and stats boosts. For instance, Tiara uses water magic, so equipping her with a fairy to boost these is a great idea. They also contain other great perks, such as restoring health or SP after battle or experience boost and much more. The fairies you equip will not start off with all these great skills, so you will have to level them up to reach their full potential. Remember how Furies sealed away the Vile God and Goddess? Well, now that you have obtained some Furies and fairies, you can release some of these seals. This is called Godly Revival, and, basically, each fairy has a Rank C to S, and you can pull out a Fury that is the same rank as the fairies you have. You can only pull out one Fury with each fairy and this will be permanent — you have been warned. This will give your Furies World Shaping Skills. Basically, when a new dungeon pops up on the world map, you have to stab a Fury in the ground to make it appear. The World Shaping Skills add various effects to the dungeons. These can vary from taking away 5% of your EXP for the dungeon, but giving you 50% more money to giving you more physical attack while taking away magic attack. These effects will have a range shown on the map before you put them in the ground, and you can use more than one Fury per dungeon for a greater effect, both good and bad. 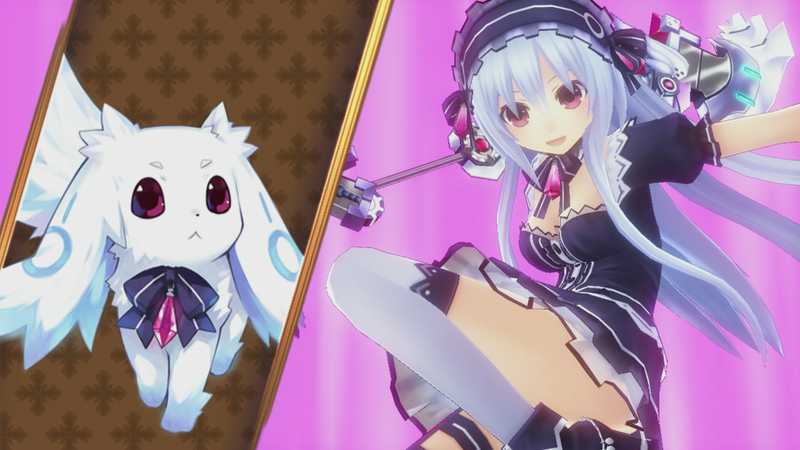 All in all, I really enjoyed my time with Fairy Fencer F. I really loved the characters and the story. 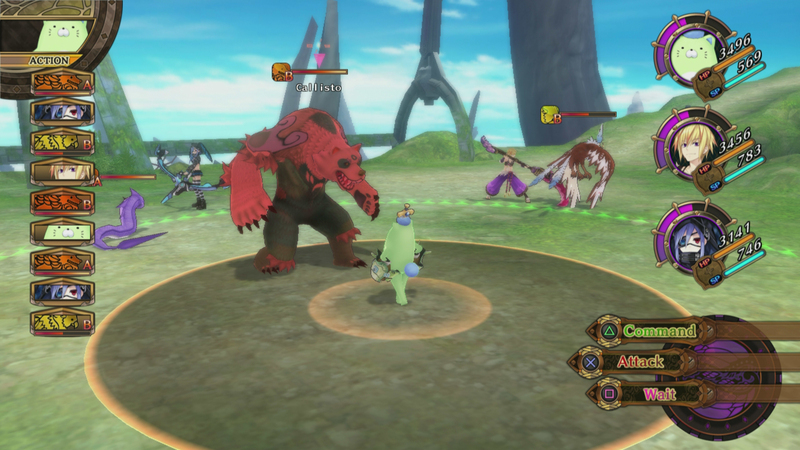 Also, being a fan of the Neptunia series, I felt right at home with the great combat. The only downside to this one is they make you redo a lot of the same dungeons twice. They had this great lore and story going, so I feel they really should have designed a few more stages to go with it. They do put different monsters and drops in the dungeons on the second run, but, still, this seemed pretty lazy. Still, though, I find it hard not recommend this one to any RPG fan looking for a satisfying game. Despite its few shortcomings, the good definitely outweighs the bad. You will want to keep a couple of save files, since this, like other Compile Heart games, has a few different endings. Though, there is a New Game Plus option if you want to go that route, as well. For its asking price of $49.99, it will take you around 22 hours to complete this adventure and probably around 30 hours if you want get everything.